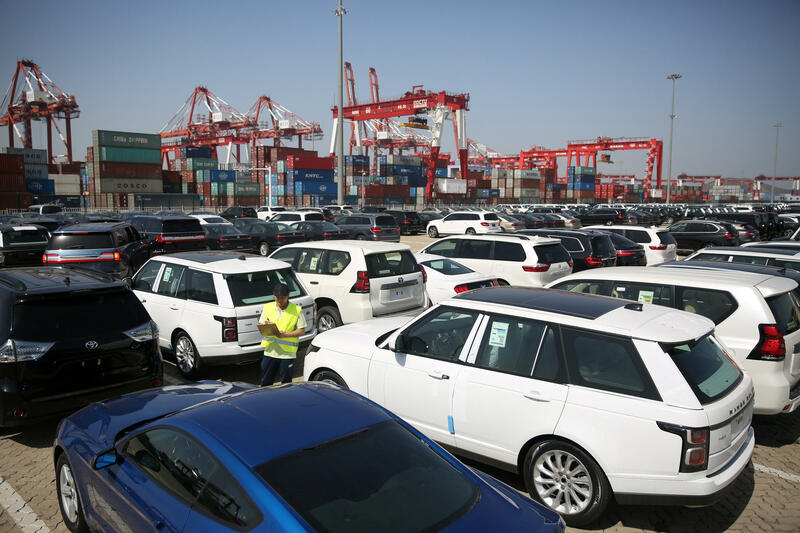 A worker inspects imported cars at a port in Qingdao, Shandong province, China on May 23. The U.S. imported $505 billion worth of goods from China in 2017, according to the U.S. Census Bureau. The U.S. exported $130 billion worth of goods to China. In the interview, which was recorded Thursday, Trump also indicated his willingness to endure stock market volatility as he pursues an aggressive trade agenda with China. Asked about the potential of a market downturn over his trade policies, he said: "If it does, it does. Look, I'm not doing this for politics." He said the United States is "being taken advantage of, and I don't like it." Trump's views on issues such as guns and abortion have shifted throughout his public life, but on trade, he has been a consistent protectionist, dating back to the 1980s. The U.S. has already slapped tariffs on $34 billion of Chinese exports, targeting China's advanced manufacturing capacity, with levies on machinery, electronics, engines and engine parts. China has responded in kind with tariffs on farm products, notably soybeans, as well as quintessential American goods such as bourbon and motorcycles, taking direct aim at Trump's base of support in farm states and blue collar regions of the country. Another wave of tariffs on an additional $16 billion of Chinese goods could go into effect in coming weeks. But much larger tariffs loom ahead. The U.S. has a list of $200 billion worth of Chinese goods that may be slapped with levies. And those products move beyond specialized equipment to consumer goods purchased by everyday Americans. U.S stock prices were mixed this morning after the president's latest barbs on trade. Excerpts of the CNBC interview were released yesterday in which Trump criticized the Federal Reserve for raising interest rates. "I'm not thrilled," he said. "Because we go up, and every time you go up, they want to raise rates again. I don't really — I'm not happy about it. But at the same time, I'm letting them do what they feel is best." That kind of direct criticism breaks with a long-standing tradition that presidents refrain from even commenting on Fed policy. Although it is part of the U.S. government, the Fed is considered to be independent, keeping it free from political pressure. Later in the day a White House spokeswoman said the president "respects the independence of the Fed." But Trump was back at it this morning in a tweet that again slammed the Fed's monetary policy: "Tightening now hurts all that we have done. The U.S. should be allowed to recapture what was lost due to illegal currency manipulation and BAD Trade Deals."